All the neurons in MLP are similar. Each of them has several input links (it takes the output values from several neurons in the previous layer as input) and several output links (it passes the response to several neurons in the next layer). The values retrieved from the previous layer are summed up with certain weights, individual for each neuron, plus the bias term. 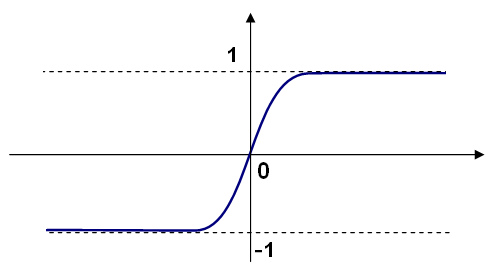 The sum is transformed using the activation function that may be also different for different neurons. Gaussian function ( CvANN_MLP::GAUSSIAN ): , which is not completely supported at the moment. In ML, all the neurons have the same activation functions, with the same free parameters ( ) that are specified by user and are not altered by the training algorithms. Take the feature vector as input. The vector size is equal to the size of the input layer. Pass values as input to the first hidden layer. Compute outputs of the hidden layer using the weights and the activation functions. Pass outputs further downstream until you compute the output layer. So, to compute the network, you need to know all the weights . The weights are computed by the training algorithm. 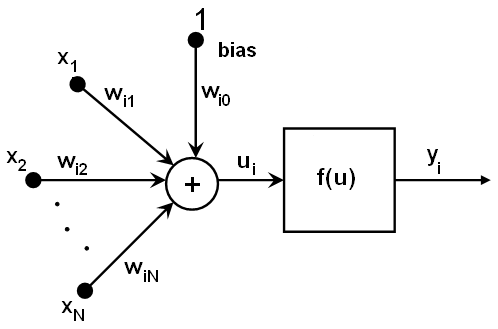 The algorithm takes a training set, multiple input vectors with the corresponding output vectors, and iteratively adjusts the weights to enable the network to give the desired response to the provided input vectors. The larger the network size (the number of hidden layers and their sizes) is, the more the potential network flexibility is. The error on the training set could be made arbitrarily small. But at the same time the learned network also “learns” the noise present in the training set, so the error on the test set usually starts increasing after the network size reaches a limit. Besides, the larger networks are trained much longer than the smaller ones, so it is reasonable to pre-process the data, using PCA::operator() or similar technique, and train a smaller network on only essential features. Another MLP feature is an inability to handle categorical data as is. However, there is a workaround. If a certain feature in the input or output (in case of n -class classifier for ) layer is categorical and can take different values, it makes sense to represent it as a binary tuple of M elements, where the i -th element is 1 if and only if the feature is equal to the i -th value out of M possible. It increases the size of the input/output layer but speeds up the training algorithm convergence and at the same time enables “fuzzy” values of such variables, that is, a tuple of probabilities instead of a fixed value. ML implements two algorithms for training MLP’s. 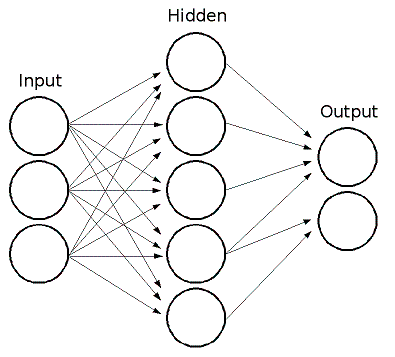 The first algorithm is a classical random sequential back-propagation algorithm. The second (default) one is a batch RPROP algorithm. [BackPropWikipedia] http://en.wikipedia.org/wiki/Backpropagation. Wikipedia article about the back-propagation algorithm. LeCun, L. Bottou, G.B. Orr and K.-R. Muller, Efficient backprop, in Neural Networks—Tricks of the Trade, Springer Lecture Notes in Computer Sciences 1524, pp.5-50, 1998. Riedmiller and H. Braun, A Direct Adaptive Method for Faster Backpropagation Learning: The RPROP Algorithm, Proc. ICNN, San Francisco (1993). Parameters of the MLP training algorithm. You can initialize the structure by a constructor or the individual parameters can be adjusted after the structure is created. Strength of the weight gradient term. The recommended value is about 0.1. Initial value of update-values . Increase factor . It must be >1. Decrease factor . It must be <1. Update-values lower limit . It must be positive. Update-values upper limit . It must be >1. term_crit – Termination criteria of the training algorithm. You can specify the maximum number of iterations (max_iter) and/or how much the error could change between the iterations to make the algorithm continue (epsilon). param1 – Parameter of the training method. It is rp_dw0 for RPROP and bp_dw_scale for BACKPROP. param2 – Parameter of the training method. It is rp_dw_min for RPROP and bp_moment_scale for BACKPROP. Unlike many other models in ML that are constructed and trained at once, in the MLP model these steps are separated. First, a network with the specified topology is created using the non-default constructor or the method CvANN_MLP::create(). All the weights are set to zeros. Then, the network is trained using a set of input and output vectors. The training procedure can be repeated more than once, that is, the weights can be adjusted based on the new training data. The advanced constructor allows to create MLP with the specified topology. See CvANN_MLP::create() for details. Constructs MLP with the specified topology. layerSizes – Integer vector specifying the number of neurons in each layer including the input and output layers. activateFunc – Parameter specifying the activation function for each neuron: one of CvANN_MLP::IDENTITY, CvANN_MLP::SIGMOID_SYM, and CvANN_MLP::GAUSSIAN. fparam1 – Free parameter of the activation function, . See the formulas in the introduction section. fparam2 – Free parameter of the activation function, . See the formulas in the introduction section. The method creates an MLP network with the specified topology and assigns the same activation function to all the neurons. inputs – Floating-point matrix of input vectors, one vector per row. outputs – Floating-point matrix of the corresponding output vectors, one vector per row. sampleWeights – (RPROP only) Optional floating-point vector of weights for each sample. Some samples may be more important than others for training. You may want to raise the weight of certain classes to find the right balance between hit-rate and false-alarm rate, and so on. sampleIdx – Optional integer vector indicating the samples (rows of inputs and outputs) that are taken into account. params – Training parameters. See the CvANN_MLP_TrainParams description. UPDATE_WEIGHTS Algorithm updates the network weights, rather than computes them from scratch. In the latter case the weights are initialized using the Nguyen-Widrow algorithm. NO_INPUT_SCALE Algorithm does not normalize the input vectors. If this flag is not set, the training algorithm normalizes each input feature independently, shifting its mean value to 0 and making the standard deviation equal to 1. If the network is assumed to be updated frequently, the new training data could be much different from original one. In this case, you should take care of proper normalization. NO_OUTPUT_SCALE Algorithm does not normalize the output vectors. If the flag is not set, the training algorithm normalizes each output feature independently, by transforming it to the certain range depending on the used activation function. This method applies the specified training algorithm to computing/adjusting the network weights. It returns the number of done iterations. The RPROP training algorithm is parallelized with the TBB library. Predicts responses for input samples. outputs – Predicted responses for corresponding samples. The method returns a dummy value which should be ignored. Returns the number of layers in the MLP. Returns numbers of neurons in each layer of the MLP. The method returns the integer vector specifying the number of neurons in each layer including the input and output layers of the MLP. Returns neurons weights of the particular layer. layer – Index of the particular layer.